When people try to search online for make money option, one of the most common way they come across is GPT sites that provides ways to make money by completing surveys, offers and tasks. 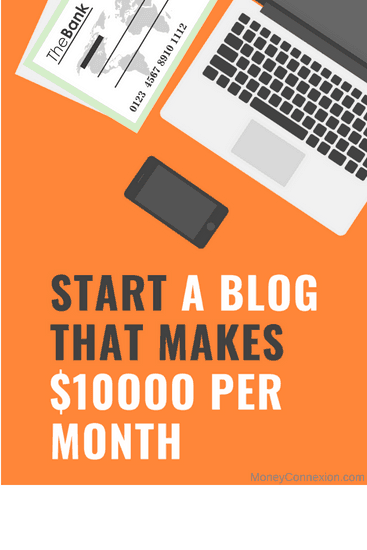 And if you try to find list of GPT sites (Get Paid To Sites), you will get hundreds or even thousands of GPT sites who claims that you can make good income from survey sites. But do you know there are only few GPT sites which are legit. And out of these best sites, I love ClixSense the most. After all, I have made around more than $81,000+ in last 5 years. First of all, you can see my total income, payouts, daily income and balance amount in the above image. I have earned $81,000+ (INR 53,00,000+) till date from ClixSense. Although my joining is January 2012, but I had started working seriously in 2013 only after receiving 2 small payouts. And that too by spending just 10-20 minutes a day on ClixSense. So if you are looking for extra income opportunity, you need to add ClixSense in your list of online jobs because it takes not more than 10-20 minutes of your daily time. So before you signup and start making money from ClixSense, I want to give you some ideas & review how exactly you can make money from GPT sites & how you can multiply your income using some simple tips & tricks. First thing you need to do is signup ClixSense from this link. After signup, you will receive a validation link from ClixSense. Once you click the validation link, ClixSense will ask you to login to your account. After you login, it will ask you to add some more details in your profile like address, phone, avatar (add your image) & most important is payment method. Also you get extra bonus for your login with ClixSense. You will be automatically enrolled to ClixsenseResearch.com. Learn more about this at the bottom of the article . There are 3 methods of to receive your payment, i.e. Payoneer, Skrill, Neteller. Payoneer is one of the most popular way to receive the payment. So I will suggest you to join Payoneer and then choose Payoneer as the payment method in ClixSense. You can connect your Payoneer account from the option given there. How to Create a Payoneer account & Receive Payment? After adding all the account details in ClixSense, click “Update” button and it will take you to their main page where you can start earning money. You can refer the image below to understand more clearly. You can see there are number of ways in ClixSense to make money. I will explain you each of the method so that you can make a big income from ClixSense. Your income will be slow for the first 6 months and after that you will be able to make better income. 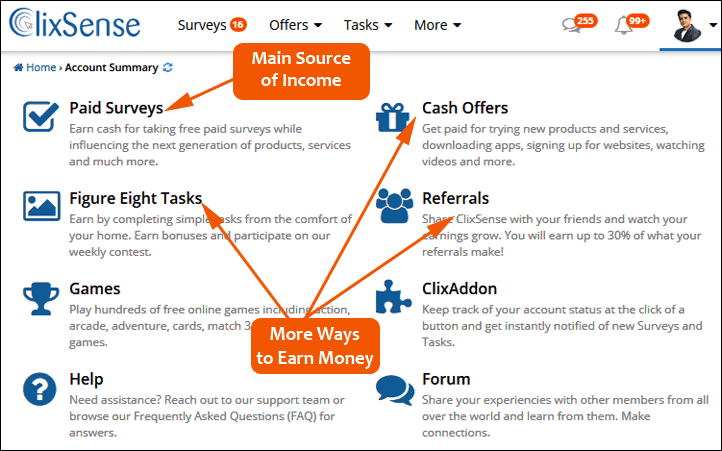 Paid Surveys are the main income option in ClixSense. Everyday you will find new paid surveys in your ClixSense account. You have to complete each and every survey after login to your ClixSense account to earn good income in ClixSense. You will find 2 types of paid surveys in ClixSense. First one is Survey Invites and second is Daily Survey Routers. 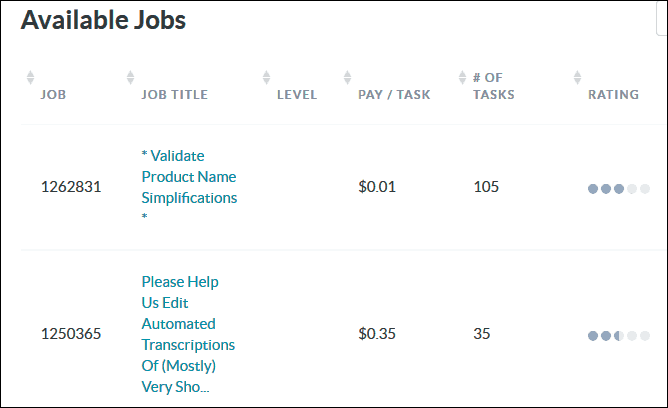 In order to receive maximum surveys, you need to complete your Survey Profile that you can find at the top left once you click the Paid Surveys option in your dashboard as shown above. You need to give accurate information about your age, education, jobs, family, hobbies, preferences etc. so that you will receive surveys according to your profile and interest. Each of the survey in Survey Invites pay you minimum $0.25 to $2 or even more according to the time spent to complete a survey. Most surveys pay instantly if you qualify except those marked with a red flag as shown in the image. You will receive payment from red flag surveys in about 30 days after completion. You can click only once on the surveys available here. You need to login to your account daily and complete each and every surveys in order to earn good amount. Sometime, surveys are rejected if you don’t qualify or if your profile is not suitable with that survey. So don’t worry about any disqualification. Just complete each and every survey you will be qualified for and earn good income with this job. Daily survey routers are surveys where you can attempt surveys unlimited times per day. Some may allow you to take the survey only once per day, while others may have higher limit. Recommended is to keep on checking multiple times at different hours to check for available surveys. You can also earn in ClixSense by completing different types of offers. These offers are available from different types of websites. E.g. you will get paid for signup on different sites, you can earn by downloading useful apps on your mobile or similar types of offers. There are around 9 different types of offers from 9 different companies through which you can earn ClixCents. These ClixCents will be converted to equivalent amount of dollars. Anytime when you login to your ClixSense account, you can find number of offers from these companies. You can check the offers, understand what it wants you to do and complete the offer to get paid. 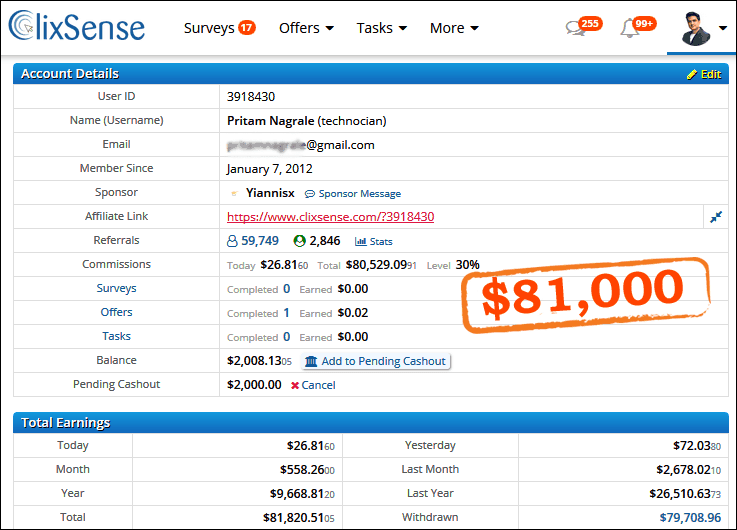 Another way to earn money in ClixSense is by completing the tasks. When you click on the ‘Task” link on the top, you will find number of different tasks provided by Figure Eight, a crowdsourcing service that enables you to work on small tasks giving the opportunity to earn some extra cash. When you click on any of the task or job given there, it will ask you to signup at ‘Figure Eight’ site. You can then complete the all the tasks provided by this company in ClixSense. You can complete the tasks that you like the most and complete them as per the instructions. There is no limit on how many tasks you can complete. You can go to the bottom of the Task page to find ‘Top Task Workers’. This is another great option for making money. You can earn unlimited income with the affiliate program provided by ClixSense. You will get lifetime income from every person that you refer in ClixSense. You will earn 3 different types of income from each of the person you refer in ClixSense. $2 bonus when each of your referral earn $5. For every approved Survey, Offer and Task your referrals complete you earn 30% commission. Suppose you referred 20 people and each of your referral earn $50 monthly from surveys, offers and tasks then your monthly earning will be $50 x (30/100)=$15×20 (referral)=$300 (INR 20,000). You can find your affiliate link in Red Color in the “Account Details” section. You can refer the first image of this post. So above are the ways, you can earn money from ClixSense. Here are some of the tips that you can use to grow your income in ClixSense. Login to your ClixSense account twice daily and check for available surveys, offers & tasks. Refer at least 1 person a day and explain him/her about the various earning methods in ClixSense. Download the ClixAddon for your browser so that you will be instantly notified whenever there is any survey, offers or task available. I am sure, you will be able to earn minimum $500 per month within next 6 months if you work consistently in ClixSense. So join ClixSense today and start earning a better income online. Good day, my name is Monalo, I already signed but how could i get payment here? I don’t think Payoneer is suited for my account, any suggestion you can give is appreciated. I’m from philippines. Please leave reply.Thank you. Thank you Sir Provied review for clixsense I am Join and start earning. Sir apki jaankari bahut hi jyada acchi hai me apko nhin jaanta tha pr youtube pr apka interview dekha ….sir aap such me great ho…humari trh se apko Best of luck…. Hi, my name is Abhilasha Sangral . I found this site reliable and beneficial but did not get the concept of surveys and offers. I would be grateful if someone could elaborate about this. My number is 8448816527. I watch your interview on tryootech how down to earth you are thankyou for sharing your thoughts mice content. is there anything like monetizing fb acct with clixsense to get 1$ per likes on facebook? Sir mai figure eight me sign up kaise karu. Jb bhi Mai sign up ke raha hun password accept nahi kr Raha hai. Hi, thanks for this kind of self supporting ideas and work. I am from Myanmar and the biggest challenge I ve faced is to creat an online payment account. PayPal isn’t activated in Myanmar, and, I don’t know how to make a skrill Account, how to transfer money from that to my bank Account, etc. Could you please help me with this kind of problems. You can mail me. Awesome article.It is compulsory to give them right information about myself. Sir I am disqualify for survey since 1 month.I complete my profile but I can disqualify for it.so please give a guide line for survey profile. Excellent Article, I have referred a lot of people in Clixsense and earn a smart income. But sometimes people complaints that due to proxy clixsense block their access. Do you know any reason why this happen in India? Since I joined, I have been denied access to surveys, task and offer. Please what should I do about it. I saw this post and started using ClixSense one week ago and I earned 7 $, the problem is I don t know how to make refer people, my friends don’t want to do it and I have no idea how pe where to post online. You are my sponsor also. Could you please help ME or at least give me some advice? @Roxi, You can check https://moneyconnexion.com/ways-to-get-direct-referrals.htm to know how to get more referral. Yes, you can use smartphone. Hi, I have signed up with clixsense and some of the site you listed and hope to earn big in months to come. And I have to say a Big Thank You for that detailed analysis. I am from Chennai, India can I join and earn in Clixsense. How I will get my payments- thru PayPal or my Indian Bank Account? Please give me complete details. I can work 5 to 8 hours a day. @Jessen, you can get payment via Payoneer. Hello Pritam, your reviews on ClixSense are quite educating,informative and eyes opening, please I would like to be informed if NetMoney.2017 is legit or a scam. I would appreciate your prompt and detailed reply on this. @Richard, I will check this site and write a detailed review if required.